Annabelle stood beneath the portico of the manor house at Davenport Hall Plantation and surveyed the estate. The warm breeze off the James River ruffled her petticoats and the afternoon sunlight danced across the shimmering fields of cotton. The seemingly-endless view of low-lying shrubs were now unkempt and unruly but that iridescent silvery haze that magically embraced the surrounding countryside each day never failed to dazzle her. Annabelle’s people were deeply rooted in this territory. The Davenport family had secured a land grant in 1650, and many generations had managed the Virginia estate, building a prosperous agricultural enterprise. She was the last of the Davenports and the guardian of their legacy. She took a deep breath, turned and entered the main hall. She walked past the parlor and made her way to the kitchen. The wallpaper in the entry hall was peeling and the curtains in the parlor hung askew. The North wall was damaged by canon fire from the Union Army. The gilded mirror had become cloudy and there were hairline cracks in the glass. Upkeep was difficult, but Annabelle remained optimistic. Today was a special day. It was his birthday. She would be reunited once again with the handsome and gallant Major Grant Finchley. Annabelle fondly pictured Major Finchley in her mind. He was tall, with a broad chest, powerful shoulders and glossy ebony hair. Standing six-foot-two, he cut an imposing figure in his pewter gray Confederate uniform. Major Finchley was an exemplary soldier. Indeed, he was commended for his bravery at the Battle of Beaver Dam Creek. Caterina was in the pantry, putting the finishing touches on the birthday cake. At one time, hundreds of slaves had worked the Davenport Hall Plantation. Caterina was an enslaved African who had been freed when the Emancipation Proclamation was signed, but she’d stayed on at Davenport Hall. 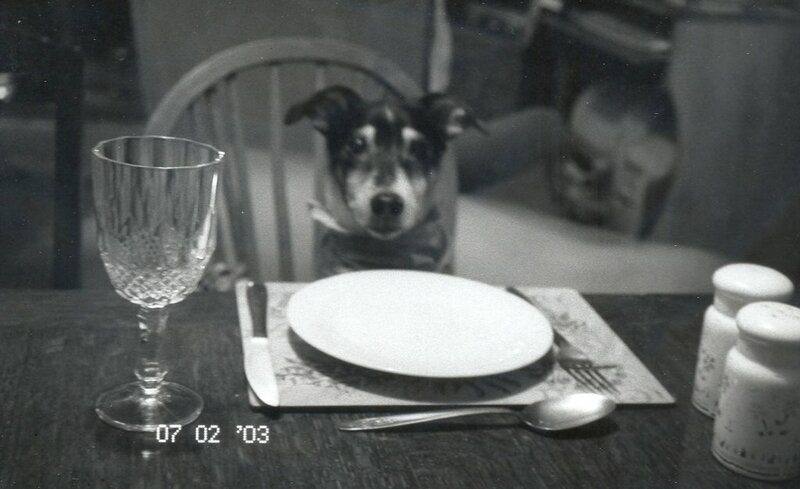 It was the only home she’d ever known, and she’d been Annabelle’s constant companion for years. Annabelle glanced down on the work table. The hand-written receipt with directions for preparing the cake was in a diminutive penmanship. She’d gotten it from her mother who had died earlier that year. “A favorite of General Lee,” Mother Davenport had written at the bottom of the receipt. This was the perfect cake to celebrate Grant’s return. Major Finchley worshiped General Lee, as had so many of her friends and neighbors. Annabelle recalled when General Lee had died in October of 1870. Thousands of mourners came out to witness the funeral procession. “Yes, Miss Annabelle.” Caterina carefully carried the cake to the parlor and Annabelle followed. She placed the cake at the center of the tea table. On the settee, a gray military uniform was neatly laid out next to an officer’s sword and a folded Confederate flag. Annabelle took a seat at the tea table and Caterina quietly backed out of the room. Her grandson Billy had crept into the entry hall and was peering into the parlor, watching with curiousity. “Why is Miss Annabelle sitting alone in the parlor?” Billy whispered. Billy’s eye’s widened. “Miss Annabelle is waiting for a ghost?" "Perhaps,” replied Caterina. “But, I think Major Finchley is still very real to Miss Annabelle, even after all these years. We should leave her alone.” Caterina pulled Billy back and silently shut the parlor door. The shadows of late afternoon had enveloped the parlor. Twilight was approaching. Annabelle cut two slices of the exquisite layer cake. She placed one golden slice at the place setting across the table, and one slice in front of her. She took a ladylike taste of the cake, the crisp citrus flavors melting on her tongue. Major Finchley was still alive to her. She could feel Grant in the room again, strong, dashing and heroic. He would always be with her. Life would change. Institutions would crumble. Some people would prosper, some would struggle, and some would die. But tradition and heroism would always survive. 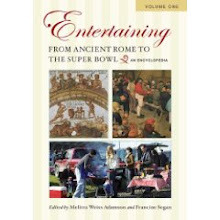 Author’s Note: Several months back, The Old Foodie sent me some recipes and historical background on the Robert E. Lee Cake for our Retro Cakes project. This cake is representative of regional confections named after revered political and historic figures. Many cakes commemorated Northern and Southern heroes after the American Civil War (1861-1865). One can find recipes for a loaf cake served with butter or jam called the Lincoln Cake, which honored President Abraham Lincoln, a style of cookie called Davis Jumbles, named for Jefferson Davis, the president of the Confederate States, or General Gordon Cake, a cornstarch cake named for a controversial Confederate officer from Georgia. 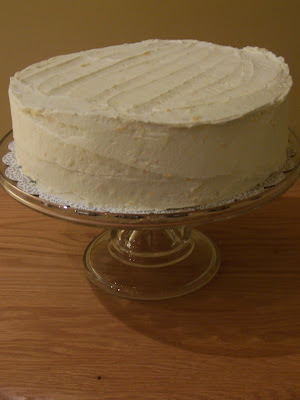 The Robert E. Lee Cake – an orange and lemon layer cake – was traditionally believed to be a favorite of the Civil War general who led the confederate troops in the “War between the States,” although this is difficult to confirm. Most sources date the first written version of Robert E. Lee Cake to 1879 and General Lee died in 1870. 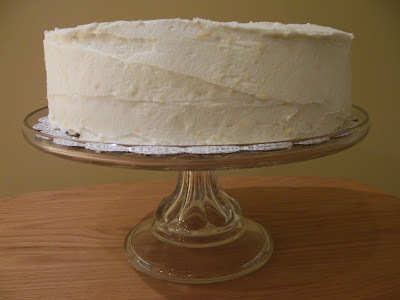 A reference in the book “The Robert E. Lee Family Cooking and Housekeeping Book” (1997) by Anne Carter Zimmer suggests that a recipe for citrus layer cake was well-known in the Lee family but never written down. She does include a recipe for a version called “Mrs. Lee’s Cake.” The early variations are complicated and time-consuming and produce very large cakes. The term "receipt" was used to describe recipes transcribed by hand and passed from mother to daughter, a practice that occurred well before the proliferation of cookbooks, cooking shows and food blogs available today. Subtle variations on a recipe would often occur between generations, and there are many versions of Robert E. Lee Cake. I used a recipe that evokes the flavors and style of the earliest versions, but employs more modern baking techniques. It is still a complex baking project requiring many techniques and lots of patience. This is a very sweet celebration cake, and the first bite of lemon curd filling packs a tart punch, much like the filling in lemon meringue pie. The fictional story of Annabelle Davenport’s longing for the return of her lover, the war hero Grant Finchley, evokes the sensibilities behind the Robert E. Lee Cake -- that of deeply-rooted pride in the history and traditions of the Old South, despite the passage of time. Today, one can still visit a number of majestic plantations along the banks of the James River in Virginia, and be transported to another time and place. I baked the Robert E. Lee Cake for the 50th birthday celebration of my brother Ken, a Civil War enthusiast who has long harbored an impish fascination with unsuspecting frosted layer cakes. I dedicate this post to Ken. 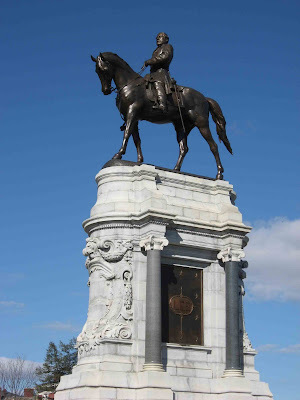 Many thanks to Veronica, the proprietor of the blogosphere’s top Test Kitchen, for graciously providing the photos of the impressive statue that stands in Richmond, Virginia as a memorial to General Robert E. Lee. Wonderful, T.W, truly Wonderful. I bet your brother really loved it, and I hope you had a great family party. You are forgiven the long time lapse since the last Retro Cake - it was worth the wait! What a lovely post, T.W.! Wonderful photos, too. That cake sounds delicious, and for me, a citrus flavors lover, perfect. Lemon and orange together?? Where's my slice?? Terrific post! I can picture Annabelle sitting at the table, waiting for her beau, nibbling on this beautiful cake. I'm sure your brother loved it and appreciated your effort to make it for his birthday. What a terrific story of Annabelle longing for her love. Happy Birthday to your brother too! 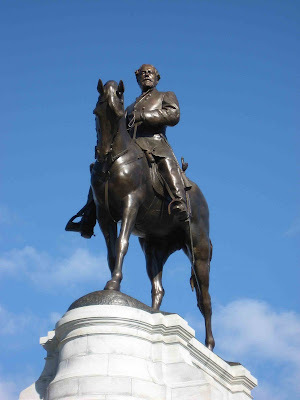 I used to work with a person who is a direct decendant of Robert lee, and let me tell you he is a spitting image of that statue. that is a delicious looking cake! Thank you, Janet, and thanks again for the inspiration! This one was an interesting challenge, but a bit like jumping into a Time Machine to experience the era. Hi Patricia - yes, your favorite flavors in one beautiful cake - you would have loved your slice! Lydia, thanks so much. I have visited a number of old plantations throughout Virginia which were helpful to conjure up the mood. Shirly Plantation on the James River is really amazing. Veron, thanks again for scouting the statue - that's so funny that you have worked with a descendant of Lee. I wonder if he's ever tried this cake?? Hi Colette - I hope you bought a good amount of oranges and lemons. My squeezing arm got quite a workout on this cake! What a thoughtful brother you are. 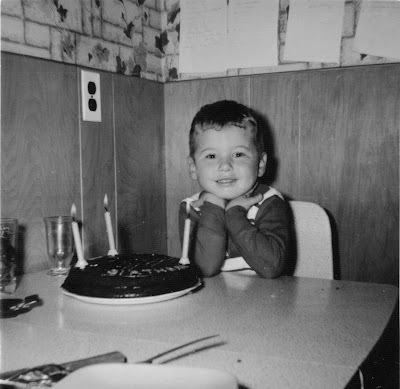 I really enjoy your Retro Cake stories and photos. Thanks for bringing another old recipe back to life! As always, a celebration I would like to gatecrash (your brothers birthday that is). An evocative tale and a delicious cake! Thanks, Kathy - I think there are some stranger stories in store! This was a great post~you put forth so much effort and what great info you share~I really appreciate the time you take to write posts like this one! That is one great looking cake for a very special person.bless you! Jann - thanks so much for the lovely comments. I do enjoy delving into these classic cake recipes and getting a sense of what it was like to eat them when they were first made. It's such a tangible connection to culinary history.